The period that followed the Second World War was perhaps one of the most creative time periods in the history of race car construction in the United States, and the Townsend Typhoon Mk IV exemplifies the latter part of that historical period to a “T”. Owen and his restoration shop known as T2V Restoration which is located in Arivaca, Arizona specialize in restoring American road racing specials built from the 1940s through to the 1960s. Once the Mk 2 “Purple People Eater” restoration was underway, Gibson began receiving leads regarding the whereabouts of the missing mid-engined Mk IV, and by 2007 had some solid intelligence gathered on the car was located. After four years of dead ends about a cowboy named Yote’s who had the car stashed somewhere north of Arizona, Gibson experienced a brilliant idea. “I called the Colorado Cattlemen’s Association and asked about ranches run by the Yote family. There were no Yote’s, but there was a Yost family just over the state line in Wyoming,” said Gibson. The original Townsend Typhoon Mk IV was born in 1964 from the remains of a wrecked Genie. Townsend created a 1.25″ thin-wall tubular chassis with conventional coil-over-suspension at all four corners. Front discs brakes were large Girling units recycled from the shunted Genie, while the rear brakes were sourced from a Corvette. The body construction came about by modifying a new Mk 9 Genie body and painting it silver once the body had been finished. Power came from a stroked aluminum Pontiac V8, acquired from Smokie Yunick, and backed by a Collotti transaxle. The Pontiac’s oiling issues became a headache to deal with, so a Chevy 427 cubic inch L-88 was later installed to rectify the Pontiac’s short comings. A Hewland gearbox was put in when it became apparent that the 427 L-88 Chevy was a bit more powerful than the Collotti could cope with. The racing history of the Townsend Typhoon Mk IV is still surfacing, as time has seemingly covered the cars tracks in competition. Owen acquired a number of dash plaques from Pete Voevodsky, the original driver of the Mk IV, three months ago. According to the dash plaques, the first race the car entered was at Phoenix International Raceway in April, 1964. Pete and the mid-engined Typhoon finished second. 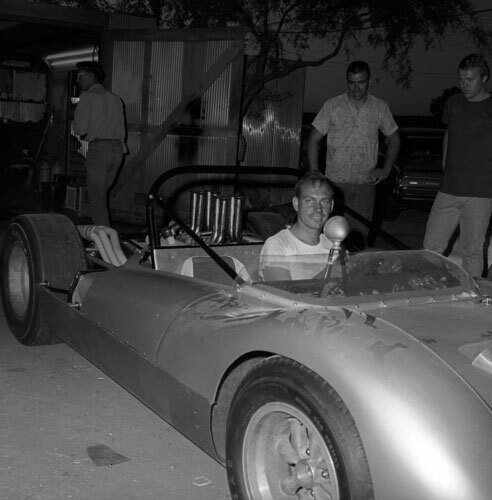 The car finished second as well at a race in Tucson, Arizona in November of 1964. 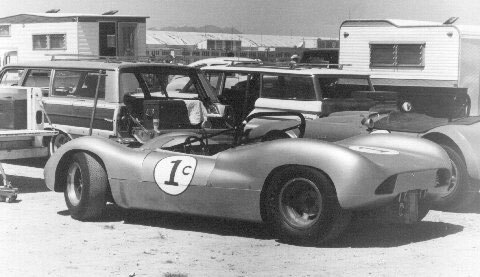 Voevodsky piloted the Mk IV to a 4th in C-Modified in the Sports Car Graphic-sponsored First Annual American Road Race of Champions held at the legendary Riverside Raceway, also in November of 1964. Returning to the 21st century; Owen prepared to travel to Wyoming to recover the remains of the awesome sports racing special he had caught wind of. Strang and Gibson drove to Denver where they picked up Voevodsky. The group was somewhat concerned that Yost was not answering his cell phone but it was too late to turn back. Gibson went in prepared. “I had scrutinized the Yost ranch via satellite images and figured out how to navigate the one lane roads from the freeway back to the ranch. As we topped the bluff over the old ranch I recognized the barn that the Mk IV has resided in since the 70s. We arrived at the ranch at exactly 9:30 AM and the only sign of life was an energetic Corgi just glad to see someone,” relates Gibson. The barn was open and inside sat the Mk IV, painted orange, tires rotting off, and covered in hay. Voevodsky and Strang circled the car; the veteran racers were glad to see their old friend, but distressed about its condition. Apparently someone had started to convert the car to use on the street, as it was found to be sporting 1967 Camaro tail lights and had head light buckets cut out in the nose. “A truck pulls up and Yost, in full Carhartt regalia, steps out,” Gibson recalls. “Been to the notary, left my phone in the tractor,” were the man’s first words. Voevodsky and Yost shook hands and the men then had a long discussion. The team then loaded the old car onto the trailer and returned back to the Gibson Ranch in Arivaca, home of T2V Racing and Restoration. Once home, the car was reintroduced to its elder sibling, the Townsend Typhoon Mark II. Gibson set about an extensive restoration of the Mk IV, just as he had performed to the older Typhoon which he reintroduced to the world in 2006 at the Monterey Historics. Gibson decided to set about restoring the American made mid engine masterpiece to its original 1964 specification. He retained the original 1.25” thin wall tubing used to construct the chassis as well as sticking to an all aluminum lower tub. The fiberglass body was restored to original Townsend specs. The brakes being used in the restored car are of Lockheed design in the front, and 1964 Corvette to the rear. Magnesium wheels are used at all four corners, 15×8 inch at the front and 15×9 at the rear. One of the more interesting aspects of the car is the fuel cell. Sticking to Townsend design, a true Bell helicopter-style breakaway fuel cell of 37 gallon capacity was fitted to the vehicle. The little car certainly needs all 37 gallons of that cell to provide fuel to the aluminum 287 cubic inch Pontiac that’s equipped with long tube headers and tuned to reach 6000rpm while producing an honest 350hp. 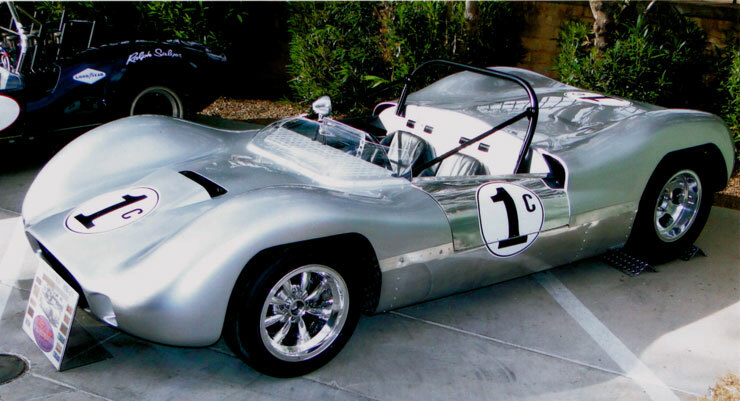 Just as the original 1964 spec car ran a Collotti gearbox, so does the restored Mk IV, sporting a T-37 serial number 1005 Collotti 4-speed, making for a rather complete time warp back to the year that most everyone knows for the Beatles arriving in America. It must be said that Owen was blessed by having the car’s original crew at his side, which helped make this restoration a little bit easier in terms of achieving authenticity. 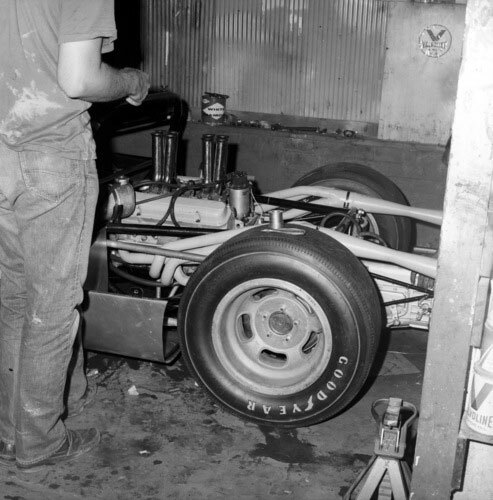 While many reflect back to the period of road racing in the late 1950s and early 1960s and talk of the dominance that the European marques enjoyed, one needs to remember that in America, and particularly out on the West Coast, young racers were building their dream cars right in their own garages and back yards and achieving performance and results that made car manufacturers around the globe sit back and take notice. Some historians may write cars like the Townsend Typhoon Mk IV off as little more than a “hot rod”, however the vehicle truly represents a time when Americans were embracing the sport of road racing head on by creating some of the most incredible machines the planet has ever seen turn a wheel in anger. This is what road racing is all about, and the Typhoon Mk IV has now been graced with a second chance to hit the historic tracks of North America and allow people to relive what was one of the greatest periods in American road racing history. For a one-off homebuilt car, it is pretty advanced for it’s time.